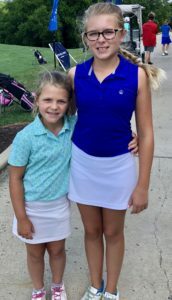 Sawyer Brockstedt of Rehoboth won her age group (12-13) in the Drive Chip and Putt local qualifier event July 18 at White Clay Creek Country Club. Last April she tied for 4thplace in the 10-11 girls’ group in the national DCP Championship at Augusta National. This time Brockstedt made the highest point total of her DCP career, with a first place in both driving and chipping. Her sister Hudson also qualified for the next DCP level in the girls 10-11 category. Her 97-point second place finish was only 6 behind first place winner Meredith Finger. Hudson tied for first in putting and took third in chipping. The next DCP hurdle for the sisters is the subregional Aug. 14 at Applebrook Golf Club in Malvern, PA.
Esther Park won this year’s Delaware Women’s Golf Association Women’s Amateur tournament at DuPont Country Club July 18-19. The Charter School of Wilmington student previously won the 2017 Delaware State High School championship in a playoff, and played in the 2015 USGA Women’s State Team tournament. Karyn Osmundson won the first flight, while Ann Reed of The Rookery won the second. Bernie Weed won the third flight, and Rosella Champion won the fourth flight. September and October are prime months for charity golf fundraisers in the Cape Region. Here are a few more. The Lewes Lions Club is holding its inaugural golf tournament Sept. 10 at Mulligan’s Pointe Golf Club in Georgetown. The event benefits the Beebe Health Care Tunnell Cancer Center’s Patient Special Needs Fund. The $100 entry fee covers the golf, player gifts, a buffet dinner, and prizes. Non-golfers may attend the dinner for $30. Registration the day of the event begins at 11:00 a.m., with a shotgun start for the scramble format at 1:00 p.m. Registration closes Sept. 1. For more information, contact Joe Donohoe at 610-368-1228 or email leweslionsclub@gmail.com. The Milton Volunteer Fire Department and Ladies’ Auxiliary are holding their annual Fall Golf Outing Sept. 19 at The Rookery South Golf Club in Milton. Registration and continental breakfast begin at 8:00 a.m., with a shotgun start at 9:00 a.m. The $85 entry fee ($320 for a foursome) includes the breakfast, beverages on course, golf with cart, lunch, and awards. The deadline and registration is Sept. 10. For more information, contact Paul Caras at 302-236-0100. The Delmar Police Department is holding their Blue Line Classic Golf Tournament Sept. 29 at Mulligan’s Pointe GC, with a shotgun start for the scramble event at 10:00 a.m. The tournament supports the Delmar Crime Prevention Fund, which sponsors holiday events, youth athletic programs, and other activities. Thirty-two four-person teams can participate, at $320 if registered by July 31 or $360 if registered after Aug. 1. The fee covers the golf, a t-shirt, lunch, and a six-pack of adult beverages per player. The Department is seeking sponsors and raffle item donations. For more information, contact Cpl. Kevin McCahill of the Delmar PD at Kevin.mccahill@cj.state.de.us. Union United Methodist Church is holding its second annual “Driving Home Hope” Golf Tournament Sept. 6 at Heritage Shores Golf Club in Bridgeville. The event supports the new Home of Hope, a new women’s shelter for those struggling with addiction and substance abuse. The 90-acre facility off Rifle Range Road is scheduled to open this fall with two dormitories, a multi-purpose sanctuary, and an administrative office with classrooms. The $125 entry fee covers the golf and cart, prizes, and a buffet luncheon. The church is seeking additional sponsors as well as players. For more information call Union United at 302-337-7409. The annual Clothing Our Kids tournament will be held this year on Sept. 24 at The Peninsula in Millsboro. All available playing spots are sold out, but the organizers are still seeking sponsor support. For more information, contact Kathleen Blouin at kblouin@outlook.com or 302-236-9825. The Rehoboth Beach CC Ladies 9-hole group played and individual low net/fewest putts game July 24. The Mulligan’s Pointe GC Ladies 18-Hole group played a better net ball of 3 or 4 game July 24. Karen Feuchtenberger, Brenda Lewes, and Dee Prillaman took first place. Joan O’Toole won first place, with Laurel St. Germain in second and Lynn Kokjohn in third. St. Germain also had the fewest putts. The Kings Creek CC Ladies 18-Hole group played a team shamble contest July 20. Sheree Davis, Kathy Casey, Margie Moore, and Susan Griesemer won first place. Jean Chlastawa, Nancy Froome, Sherre Mixell, and Barb Weissenberger took second, while third place went to Wendy McClay, Nancy Martino, Vicki Martina, and Anne Farley. Rehoboth Beach CC held two events the same day July 18. Dale Lipnick won first place net in the Ladies Presidents Cup tournament, while Suzanne Moore won first place gross. Daisey Hudson finished second net and Sally Fogarty took third net. The RBCC Ladies 18-Hole group played a team low net contest, won by Barbara Collins, Elise Coar, Lora Drewer, and Trish Medd. The Kings Creek CC Ladies 9-Hole group played their team shamble event July 18. Sandy Neverett, Noreen Bruzerak, and Linda Miniscalco (blind draw) won the day. Kara Bourdreau won closest to the pin on the 17thhole.